Happy Father’s Day! What Dad doesn’t like to grill on Dad’s day! Instead of the usual burgers, brats and steak, why not make Dad some shish kabobs to grill…or better yet, why not make these tasty Oven Roasted Pork Tenderloin Kabobs, and give Dad the day off. 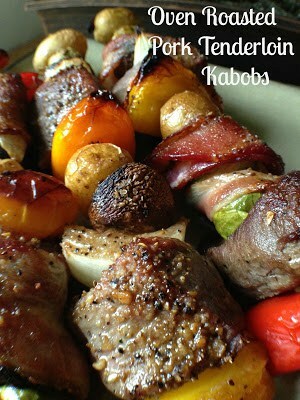 Kebab; Kabob [kuh-BOB] Also called: shish kebab and shashlik. Definition: Small chunks of meat, fish or shellfish that are marinated before being threaded on a skewer and then usually grilled over coals. Pieces of vegetables can also be threaded with the meat on the skewer. If using wooden skewers, soak them first in water, wine, beer or fruit juice for at least 4 hours or up to 24 hours. This will prevent the wooden skewers from burning and at the same time, adding flavor to your kabobs, if the skewers were soaked in wine, beer, or fruit juice etc first. 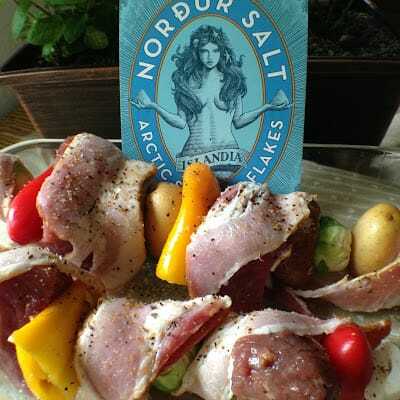 This recipe is a great way to use marinated pork tenderloin that can be found in the meat department of all supermarkets. If you can’t find marinaded pork tenderloin, you can simply make your own. Marinade a regular or plain pork tenderloin with your favorite marinade. How easy is that! 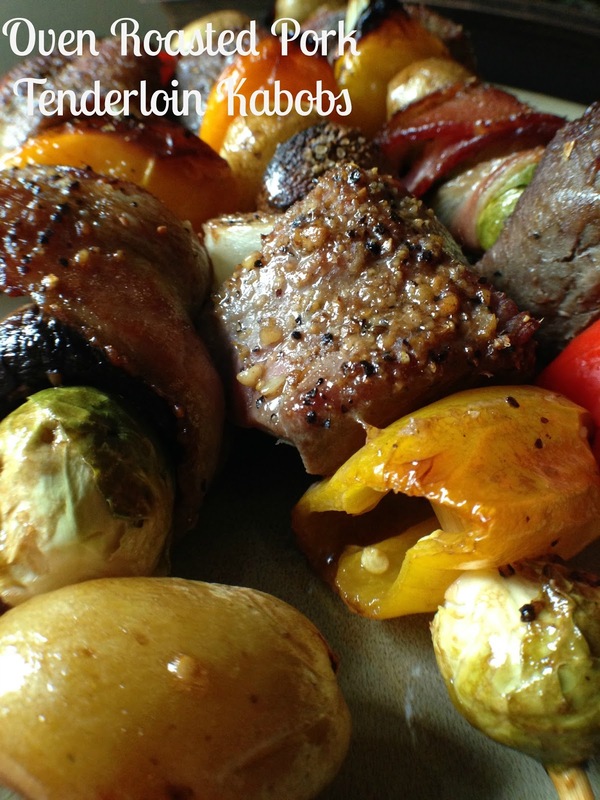 This recipe is extremely versatile and of course delicious. 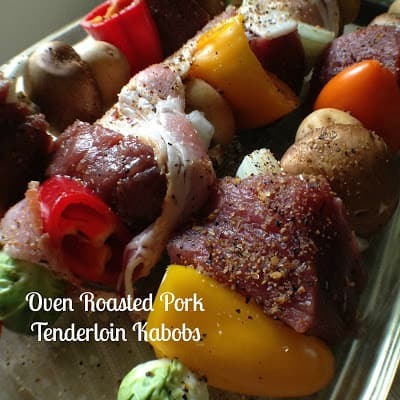 Pork tenderloin is not only a very tender cut of meat, it’s very flavorful, can be used in many different recipes and always turns out, no matter what method you use to cook it. 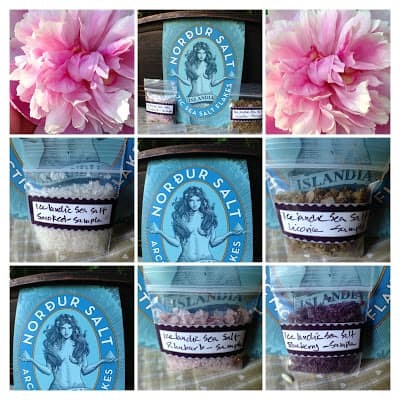 If you have the time, you can certainly make your own marinade or you can buy one of the many, many varieties of delicious marinades that are on the grocery store shelves….Have you ever stood and counted all of the different kinds of marinades, grilling sauces and barbecue sauces that are available?? I have, and let me tell you, there are hundreds. But then one day, while shopping at the local Piggly Wiggly, right there in the meat department, out of the corner of my eye, I spotted Stoneridge Door County Cherry Pork Tenderloin. Needless to say I was thrilled and I started filling my cart with pork tenderloin. 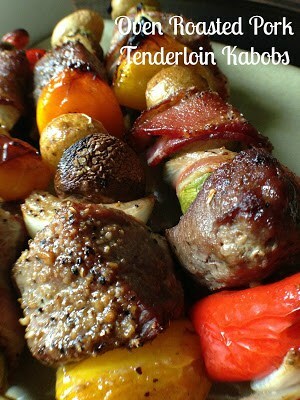 There are so many reasons why I like making shish kabobs; 1. 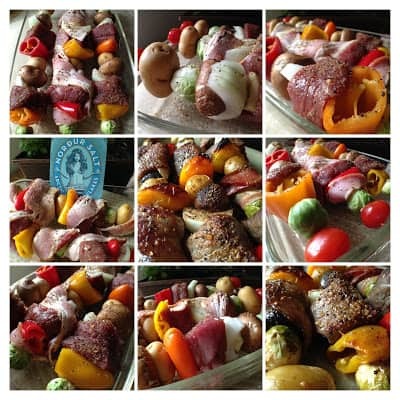 You can use any combination meat or fish and your family’s favorite vegetables 2. Fruit is a tasty option pineapple, peaches and plums all work well 3. 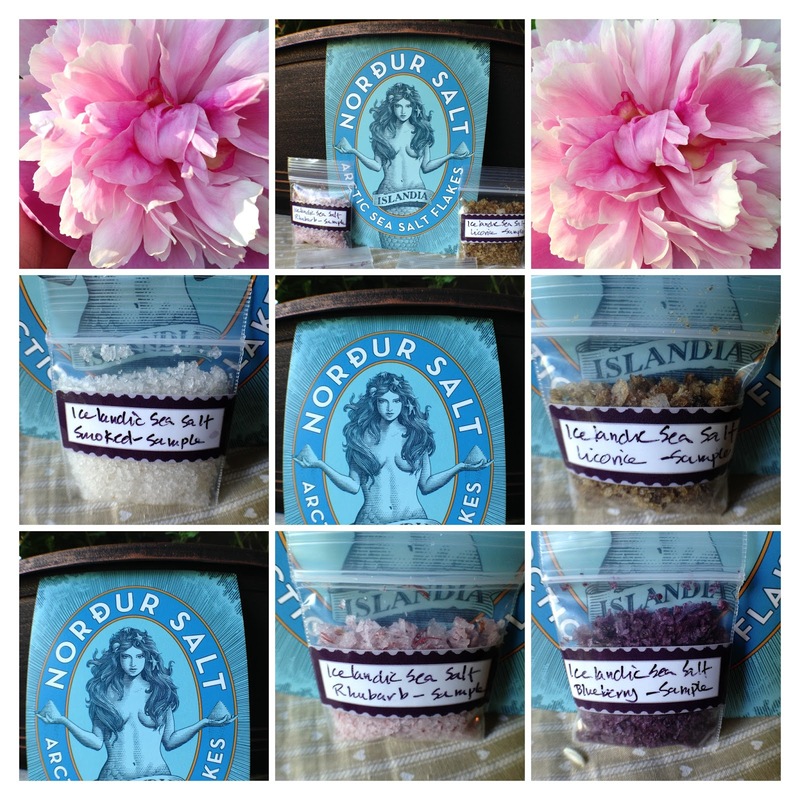 Fresh herbs can be used; mint with fruit, dill with fish, sage with poultry 4. Kabobs are a great vegetarian option. For this recipe, we used Organic Aged Balsamic Vinaigrette from Aldi to baste the kabobs while they were baking. A wonderful, flavorful vinaigrette, perfect for this recipe. 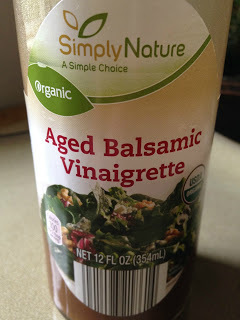 You can easily make your own balsamic vinaigrette or use your favorite brand of vinaigrette. Soak 12 wooden skewers in water overnight. 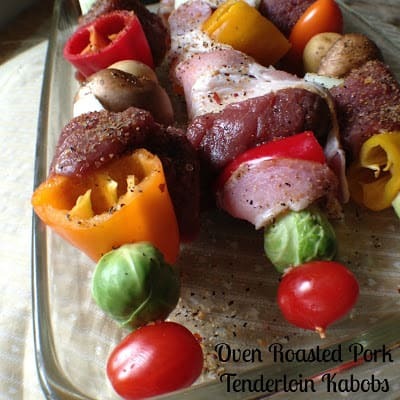 Alternate the assorted veggies with meat on the skewers. Alternate bacon wrapped skewers and unwrapped skewers in two 13 x 9-inch glass baking dish. Place the skewers in the oven on the center rack. Bake for 35 to 45 minutes. Check vegetables to see if they are tender. Remove baking dishes from oven. Carefully spoon aged balsamic vinaigrette over skewers. Bake an additional 10 to 15 minutes longer. 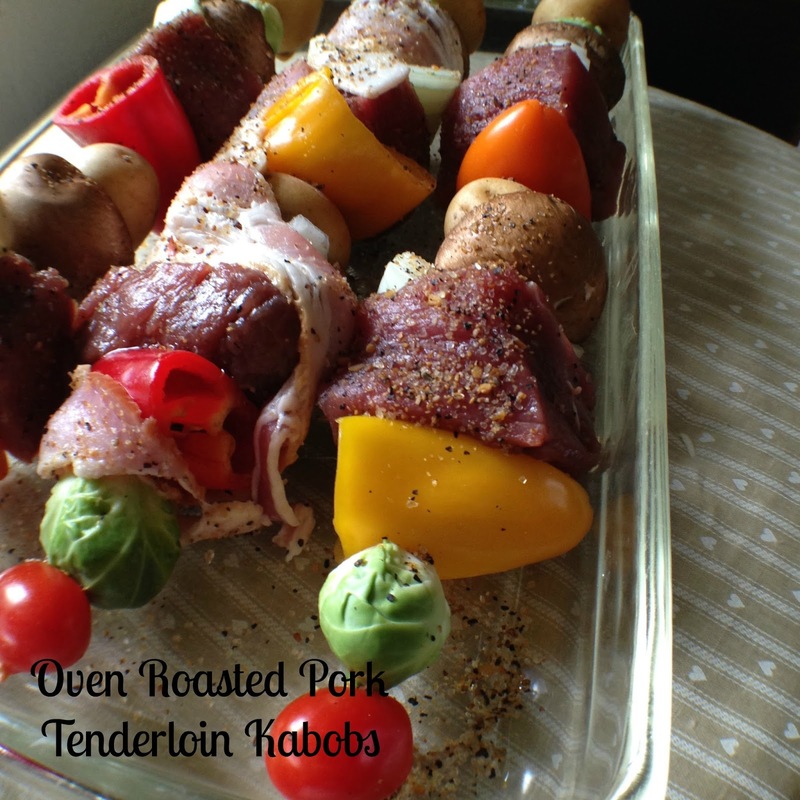 Remove baking dishes from oven, transfer kabobs to serving plate. 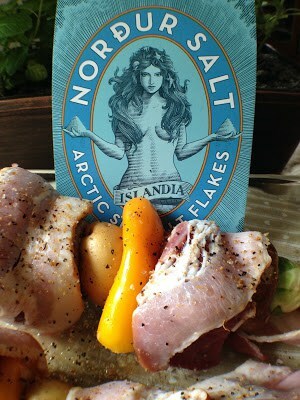 Sprinkle the kabobs with smoked sea salt and fresh cracked pepper, to taste. Optional: stir drippings in baking dishes. Add 1/4 cup of room temperature white wine to drippings stirring constantly, while scraping up any bits left in pans. 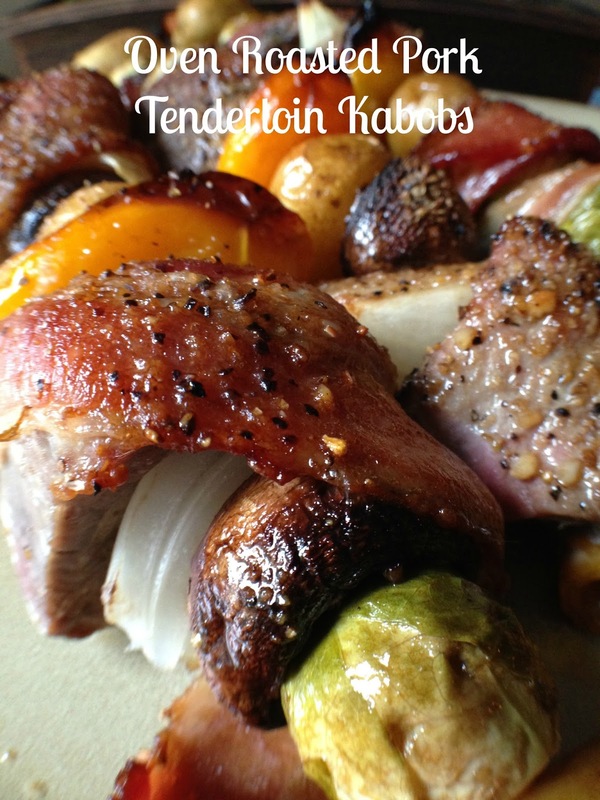 Spoon drippings over kabobs and serve. Cooking times will vary depending on thickness of meat and vegetables used.